Now see, I don't feel this is fair. Our green monster on the left, yeah, he wasn't really nice to the Enterprise crew, but this was the M-113 Salt Creature - it didn't mean to shapeshift into someone McCoy loved, it just needed our precious bodily salts to survive! That's not fair to the salt creature at all! 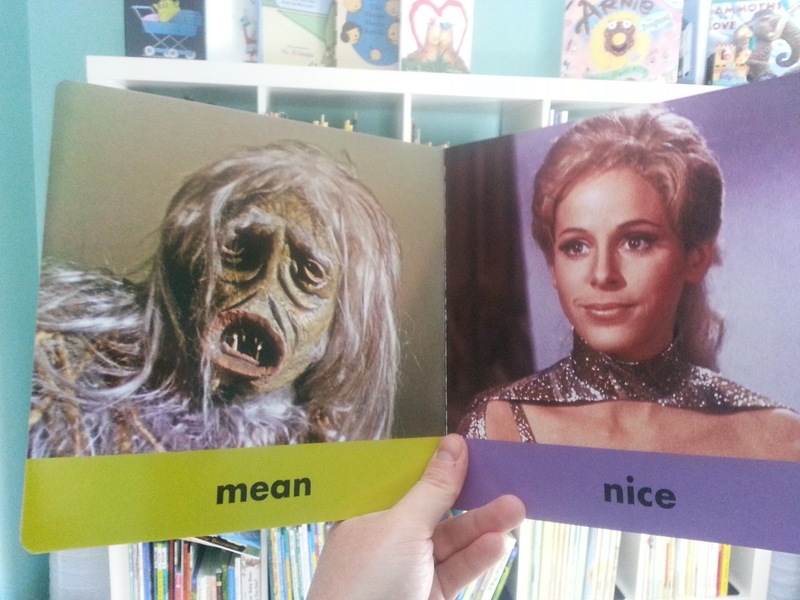 I can't remember who the "nice" woman is, but I'm sure "nice" is code word for doing dirty, dirty things to Captain Kirk. I was so surprised I couldn't get a clear image of the page, even after four attempts! I really can't think of a better way to describe calmness than Leonard Nimoy's Spock. Logic has its benefits, I suppose, but I had to laugh when I turned the page to this and saw these two next to each other. It's also why I find the Quinto Spock that different, as the Vulcan calmness definitely takes a backseat in many scenarios in Quinto's interpretation. That's not a bad thing, but this page reminded me of that. 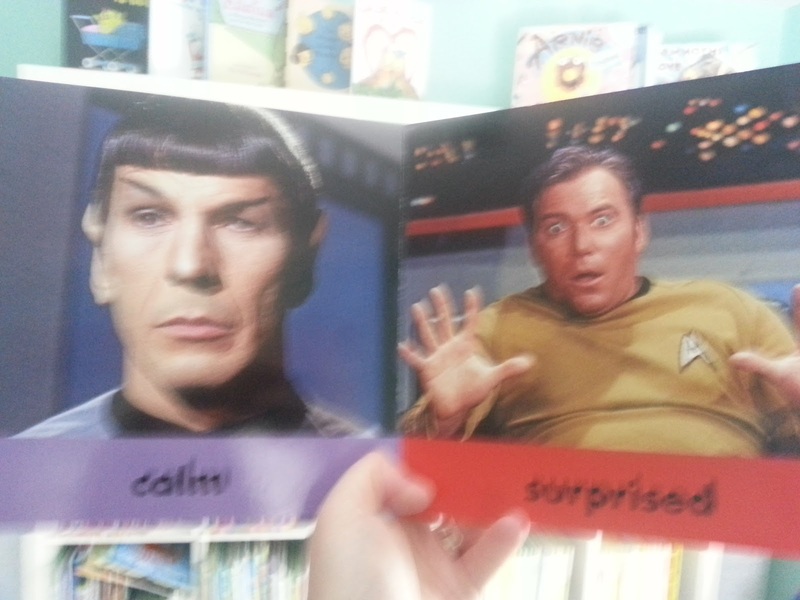 This page also reminded me of how...uh...unique William Shatner's acting style is. No one should be "surprised" that subtlety is not his strong point. Forget Pet the Bunny, man, the one thing this book is lacking is some faux fur to help pet the creature. 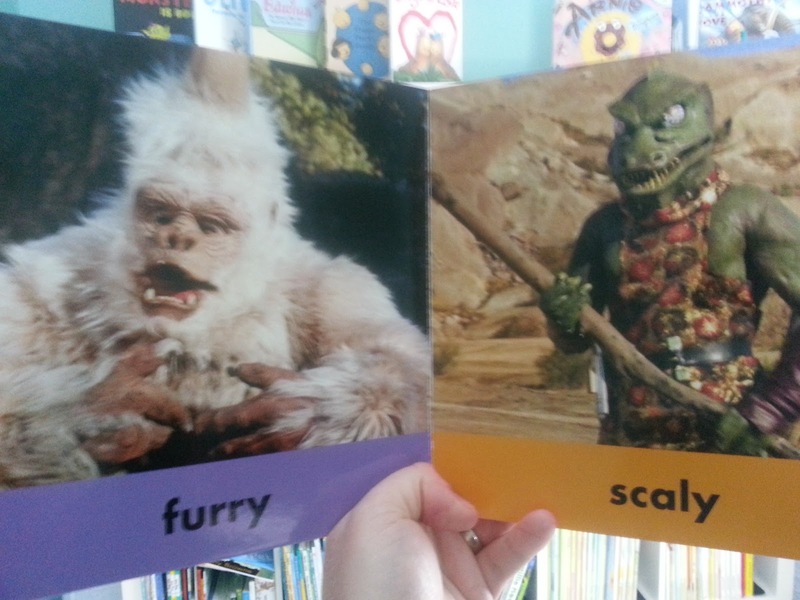 Of all the pages in this book, these two are the ones I'm most nervous for my future spawn initially - there's not the most kind looking creatures on either side, and they might be a little scary for the little squirt. Of course, when the heroes save the day, they don't care much if they're furry or scaly (well, Kirk might...), so that might be the angle to take on this. 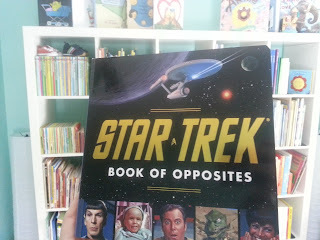 Either way, if you're looking for something fun and different to share with your kid or Star Trek fan, this book will do the trick for you. It's published by the same folks who brought you Pride and Prejudice and Zombies, so you know it's good. Great book! I think that salt creature is the scariest though. I would have run a mile away from that book as a child.